The Robert May Prize is awarded annually for the best paper published in Methods by a young author at the start of their research career. 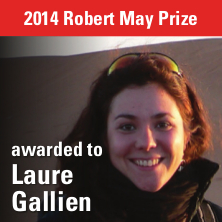 We’re delighted to announce that the 2014 winner is Laure Gallien, for her article ‘Identifying the signal of environmental filtering and competition in invasion patterns – a contest of approaches from community ecology‘. Today, biological invasions are of major concern for maintaining biodiversity. However, understanding what drives the success of invasive species at the scale of the community remains a challenge. Two processes have been described as main drivers of the coexistence between invasive and native species: environmental filtering and competitive interactions. However, recent reviews have shown that competitive interactions are rarely detected, and thus their importance as drivers of invasion success placed under question. But can this be due to pure methodological issues? Using a simulation model of community assembly, Laure and co-authors (Marta Carboni and Tamara Münkemüller) show that the infrequent detection of competition can arise from three important methodological shortcomings, and provide guidelines for future studies of invasion drivers at the scale of the community. During her MSc in Biodiversity, Ecology and Evolution, Laure became passionate about the study of biological invasions, and decided to carry out a PhD on the ecological and evolutionary drivers of invasion with Wilfried Thuiller and Sébastien Lavergne at the Alpine Ecology Lab in Grenoble (France). She currently lives in Switzerland and works as a post-doc with Niklaus E. Zimmermann at the WSL institute, where she explores the influence of evolutionary history on extant species invasiveness. – Kevin Arbuckle from the University of Liverpool, for his article ‘A simple measure of the strength of convergent evolution‘. – Christine Howard from Durham University, for her article ‘Improving species distribution models: the value of data on abundance’. The above 3 articles are included in a free virtual issue, along with all of the winning and highly commended articles from the other four British Ecological Society journals young investigator prizes. This entry was posted in General, Journal updates, Methods papers, Robert May Prize, Society, top papers, Virtual Issues and tagged Biological Invasions, Christine Howard, community ecology, Envitonrmental Filtering, Invasion Patterns, Invasive Species, Kevin Arbuckle, Laure Gallien, Robert May Prize, Young Investigator Prize by Chris Grieves. Bookmark the permalink.